As a graduate student I worked on developing a proxy for reconstructing the carbonate ion concentration in the deep ocean using changes in the Mg/Ca ratio of planktic foraminifera. The Mg/Ca ratio decreases as a function of bottom water carbonate saturation state. We applied the proxy to two regions: The western equatorial Atlantic (Fehrenbacher et al., 2006) and the western equatorial Pacific (Fehrenbacher and Martin, 2011). We first reconstruct the Holocene carbonate ion concentration over the range of core depths for each region (the figure below details the modern carbonate ion gradient and the Holocene reconstruction using core-top samples). 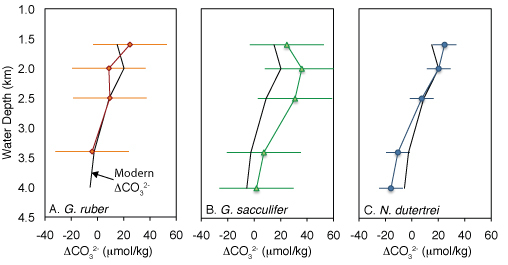 We then reconstructed the Atlantic carbonate ion concentration during the last glacial maximum (LGM) and the Pacific carbonate ion concentration during the LGM and deglaciation. See the papers highlighted above for the LGM results. More to come... visit soon for details or download the papers using the links above.